Every week co-workers and I take turns bringing in breakfast on Friday. 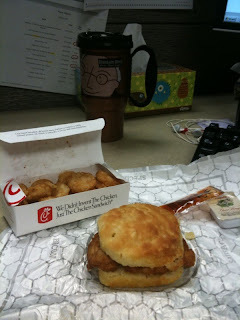 Most of the time we bring in bagels from Einstein's but once in a while we get a special treat ... chicken biscuits from Chik-fil-a! And since we are down to so little people in our breakfast group we get spoiled on some days. Not only did we get a delicious chicken biscuit that I smothered with Texas Pete hot sauce and honey, but also an order of freshly fried hash browns. Not a bad way to start off the day!